Home Applications You can explore thousands of DJ mixes on your iPhone! Don't miss this opportunity, download Mix.DJ Pro 2 NOW! You can explore thousands of DJ mixes on your iPhone! Don't miss this opportunity, download Mix.DJ Pro 2 NOW! DigitalDeejay announced the immediate availability of new version of Mix.DJ Pro. 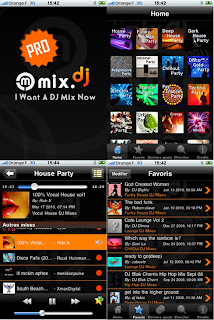 Mix.DJ Pro 2.0 is an iPhone and iPod touch application that streams over 16,000 pro and amateur DJ mixes from around the world in one click. The latest version offers improved stability and faster performance, and you can listen over 16,000 DJ mixes anytime and anywhere via WIFI or 3G. In addition, if you find songs inside a mix that you like, just click on the song and it will be sent to iTunes where you can purchase the download of that song. Mix.DJ allows you to select your favorite mixes and save them to "My Favorites". Users can browse mixes based on style, genre, artist, mood, and more. Song mixes are available from amateur and professional DJs such as David Vendetta, Dim Chris, Mark Farina, Superfunk, Benjamin Braxton, Jay-J, Kevin Yost, Alan master T, and Michael Kaiser and others. Pro 2.0 is priced at US$0.99 and is available at Apple's iTunes based App Store.